Left to right: Shawn Reilly, President of the Boulders, Jeffrey C. Heaphy, President of the Board for CANDLE, Hannah Beebe, intern for the Boulders, and Courtney Caden, on-field host, Joanne Goodman, Executive Director of CANDLE, Boulder Bird and Joe Allen, Senior Vice President, Employee Communications and Community Affairs for Active International during the check presentation to CANDLE at the recent Boulder’s Charity Challenge game. Community Awareness Network For A Drug-Free Life And Environment, Inc. (CANDLE) was celebrated at the May 24 Rockland Boulders game at Palisades Credit Union Park. Board members, staff and supporters came out to watch the game and purchase raffle tickets to support the organization. 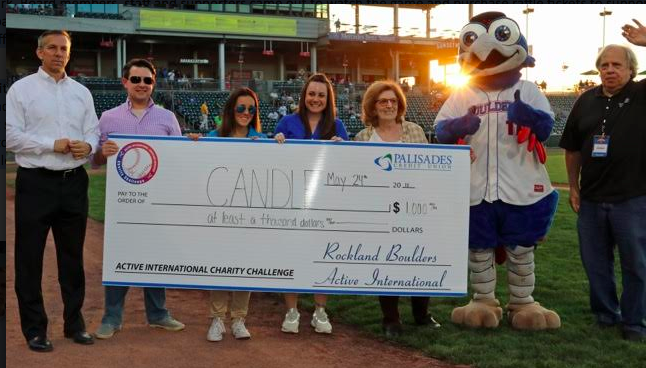 The event and 50/50 raffle is part of the Annual Active International/Rockland Boulders Charity Challenge. CANDLE received $896 from the 50/50 and so did the anonymous winner of the raffle. The Charity Challenge is a year-long promotion that lets the Boulders and Active International support local charities. Charities chosen to participate can fundraise at the stadium, chat with fans about their program, and offer informative material. The charity that raises the most funds during their event returns on the following season’s Opening Day for another fundraising opportunity. Through charitable contributions and volunteer service initiatives, Active International gives support to activities and organizations that are important to employees, clients and vendors. Over more than 15 years, that support has reached more than 600 separate local, regional and national organizations.